Treatment regimen in frontal fibrosing alopecia (FFA) is given based on the presence of inflammatory signs (perifollicular erythema and follicular hyperkeratosis) or by the presence of symptoms even though their absence does not exclude disease progression.,, In early stages, partial hair regrowth is possible; however, in late stages, treatment offers no benefit. We performed a prospective study with the objective of evaluating if the examination with ultraviolet (UV)-light-enhanced trichoscopy (UVET) may be used to predict potential efficacy of medical treatments in FFA. Twelve female consecutive patients with FFA were included, with a mean age of 48 years (range 39–63 years). Patients received oral dutasteride 0.5 mg, clobetasol propionate 0.05% foam, and topical 5% minoxidil daily. Clinical response was observed after a 6-month follow-up period. 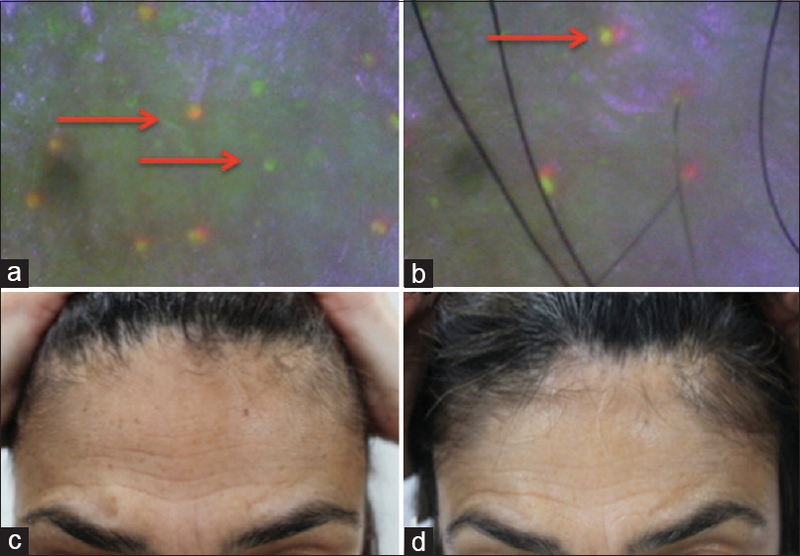 A positive pattern of fluorescence within the follicular ostia was observed using UVET with × 50 amplification in seven patients and negative in remaining five patients. In the 6-month follow-up visit, in those patients with positive fluorescence, 57.1% (4/7) showed a partial hair regrowth and 42.9% (3/7) showed disease stabilization [Figure 1]c and [Figure 1]d. In patients with negative UVET, no hair regrowth was observed [Figure 2]c and [Figure 2]d.
The UVET uses UV type A long wave, with a wavelength peak at 365 nm, which when applied to the skin will generate a characteristic fluorescence in the presence of certain skin conditions. Propionibacterium acnes, which can be found within acne comedones, generates a red-orange fluorescence caused by the production of porphyrins when illuminated with this UVET. Further, compacted keratin usually shows a whitish-yellow fluorescence with the same illumination. We use a ×50 trichoscopy with a UV light lent (MicroCAMERA®, Dermotricos SRL, Coccaglio, Italy) that allows the objective visualization of this pattern of fluorescence within the follicular ostia. This clinical image is reminiscent of “starry night over the Rhone” by Van Gogh, hence why the authors have named the sign “starry night sky sign” [Figure 1]a and [Figure 1]b. Thus, if this fluorescence is positive, it can be assumed the presence of follicular Propionibacterium, and therefore, the possible preservation of the follicular unit viability, indicating a better prognosis. On the contrary, if the follicular unit is fibrosed, this activity will not be observed [Figure 2]a and [Figure 2]b. We hypothesize that after exploring the entire frontotemporal line, if the “starry night sky sign” is positive in any area, local treatments may be used to stabilize alopecia and even achieve a partial regrowth. In the absence of this sign, local treatment with topical and/or infiltrated corticosteroids would not be advisable because of the unlikelihood of improvement. We believe that UVET is a complementary tool to trichoscopy and clinical examination to improve detection of disease progression. No biopsies were performed because of patients' reluctance of a scar in their frontotemporal line, but the positive clinical response after treatment when the sign is present makes us assume its utility. We propose UVET as a simple and inexpensive tool that may predict the potential efficacy of medical treatments in FFA. Moreno-Ramírez D, Ferrándiz L, Camacho FM. Diagnostic and therapeutic assessment of frontal fibrosing alopecia. Actas Dermosifiliogr 2007;98:594-602. Tosti A, Piraccini BM, Iorizzo M, Misciali C. Frontal fibrosing alopecia in postmenopausal women. J Am Acad Dermatol 2005;52:55-60. Fernández-Crehuet P, Rodrigues-Barata AR, Vañó-Galván S, Serrano-Falcón C, Molina-Ruiz AM, Arias-Santiago S, et al. Trichoscopic features of frontal fibrosing alopecia: Results in 249 patients. J Am Acad Dermatol 2015;72:357-9. Vañó-Galván S, Molina-Ruiz AM, Serrano-Falcón C, Arias-Santiago S, Rodrigues-Barata AR, Garnacho-Saucedo G, et al. 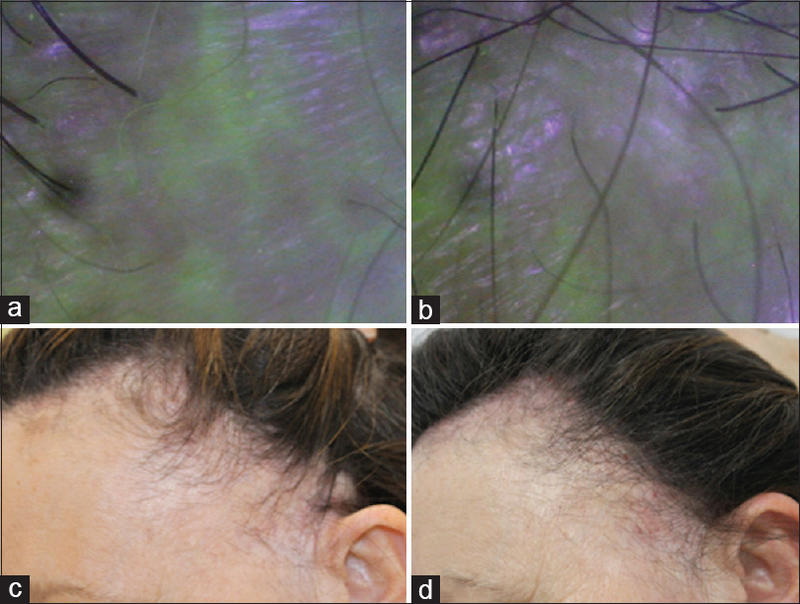 Frontal fibrosing alopecia: A multicenter review of 355 patients. J Am Acad Dermatol 2014;70:670-8. Klatte JL, van der Beek N, Kemperman PM 100 years of wood's lamp revised. J Eur Acad Dermatol Venereol 2015;29:842-7.